Our cottage dates back over 160 years. Peacefully secluded at the end of a small row of cottages, offering a warm and friendly welcome with exposed beams and inviting log burning stove. Just perfect for lovers of the outdoors, with own private garden and off street parking. The village of Brynamman is situated on the south facing side of the Black Mountain, part of the Brecon Beacons National Park, and has become the home of The Black Mountain Centre which makes it the perfect base to explore the Brecon Beacons, The Waterfall Country and The Gower Peninsula, aswell as being the ideal base for enthusiastic walker's and cyclists. With a host of attractions to include Carreg Cennen Castle, one of the most famous and privately owned castles in Wales, The National Botanic Garden of Wales with its restored gardens and excellent tea room, and The National Showcaves of Wales, (Dan yr Ogof) which makes for a great family day out. A little further afield, The Gower Peninsula, Pembrey beach with golden sands and views across Carmarthen Bay, and The Pembrokeshire National Park. Our charming cottage comprises of an open plan living / dining room with cozy log burning stove, dining table, and information bureau designed to ensure our guests are provided with as much information about the local and surrounding area as possible, aswell as an array of books, DVD's and games. A well equipped kitchen with electric oven and hob, fridge/freezer, dishwasher and microwave. 2 cozy bedrooms. The master bedroom is arranged as a double room, and has drawers for storage aswell as a hanging rail, & suitcase rack. The smaller bedroom can be arranged as a kingsize or twin room on request and has limited storage. The large bathroom with bath, separate double shower and WC is the perfect place to relax and unwind. An enclosed tiered private garden with patio area and seating, ideal for summer BBQ's or enjoying the sunshine. Utility room housing the washing machine and tumble dryer. Parking for 1 car. Bed linen, 2 x bath towels & 1 x hand towel per stay, electric, heating and Wi-Fi included. Upto 2 dogs are welcome subject to a few house rules which can be found on our website, and a charge of £15 per dog per stay payable locally. Nestled at the end of a private lane, with pubs/restaurant, small village shop & The Black Mountain tourist centre all within walking distance. Brynamman is a village which I am proud to call home; now living in the hustle and bustle of Brighton, I love my trips back to my homeland and am always taken aback by how beautiful the backdrop of the Black mountains are over the village. With my family still living there, I enjoy going home to speak my native language Welsh. My work gets me traveling the country and the world regularly and with 14 years of staying in hotels weekly, I have an eye for product, quality, service and comfort. I hope you book with us and enjoy the village, the area, and the cottage as much as I do. The cottage has been refurbished to a very high standard. It is emasculate and has everything you could need for a good relaxing break. We received a welcome basket of chocolate, spreads, a bottle of wine! And there’s even an honesty mini bar!! There four of us and 2 dogs and we were lucky enough for the weather to shine on us. We used the Derlwyn Arms for our evening meals as they were happy to have the dogs. Great food and friendly. My wife, sister and I visited for a few days. 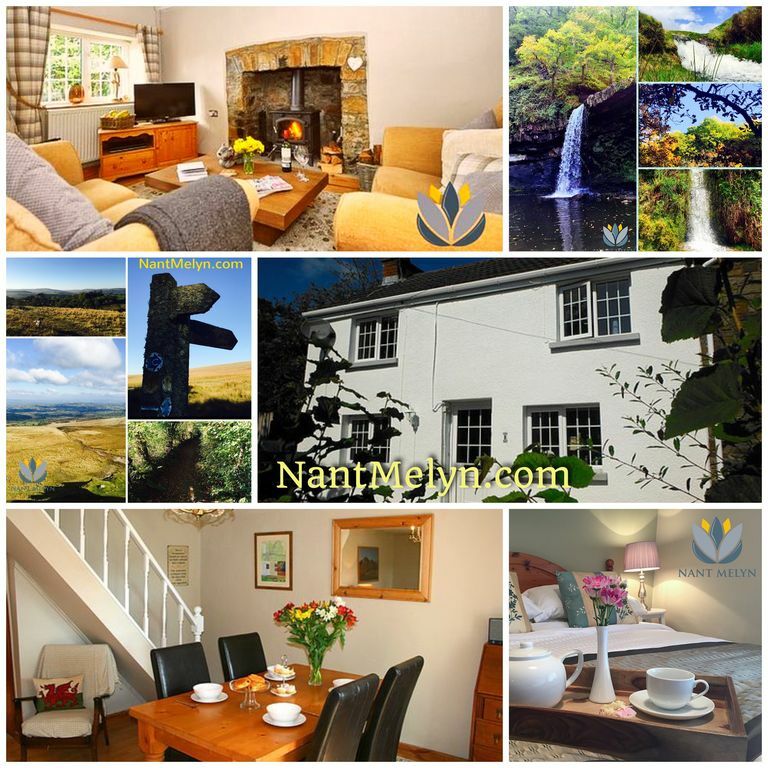 We loved our long weekend in this cosy homely cottage - Steven was really helpful in providing all the information we needed before and during the stay, including lots of recommendations on places to explore in the surrounding area which is spectacular. The cottage itself made us feel instantly relaxed and at home, with everything we needed and loads of extra touches. We particularly enjoyed the roaring log fire in the evenings. We'd definitely highly recommend to anyone who wants to explore the outdoors and is looking for a quiet, comfortable place to 'get away'. And welcoming cottage. Well situated for our short break walking with our dogs. The cottage has everything you could need. All the little extra touches just help to make you feel comfortable. I was wary of the stairs but only due to having slipped on the stairs at the local castle! Great cottage for 4 people. Felt spacious. Good garden for the dog. Ideal for visiting Black Mountains and Gower in one holiday. Was really very comfortable and felt homely. We had a wonderful week here in this pretty little cottage. Although there isn't really anything in Brynamman itself, we found the location to be good for exploring the local area, going to showcaves, waterfalls, Tenby, Pembrey Country Park and Carreg Cennan castle amongst others. The cottage is very clean inside and has everything you need amenities wise, including a dishwasher, washing machine, tumble dryer, and electric oven, all of which are to a high specification. The bathroom is superb with a huge shower and bath. Plenty of games, books and DVD's are also provided, together with bottles of wine and spirits at a reasonable charge. Particularly appreciated was the welcome basket left for us. Steven was very easy to communicate with before the stay, getting back to us straight away and being very accommodating when I had to change the dates slightly due to my daughter's GCSE results! My only criticism was the complete lack of storage in the second bedroom which was a problem for two teenage girls. The room is quite small so I understand the challenge but I do feel this needs looking at, maybe some beds with inbuilt storage space could be used? Overall though, we had a wonderful time in a lovely cottage and wouldn't hesitate to stay here again or to recommend to others. Many thanks! Oh, and we had a wonderful meal at the nearby Pen Y Cae Inn - truly superb! The cottage was lovely and had everything we needed for a short break. Everything was set out brilliantly, and with all the information to hand, we never had any problems working any of the equipment. Location is great as just down the end of the road there is open countryside, with more blackberries than you could ever hope to pick. We went to Tenby, Carreg Cennen Castle and Dan-yr-ogof caves. All within an acceptable distance of the cottage. We felt it was an ideal base to begin your adventures. We highly recommend this property.